Good: Kindle For The Mac. 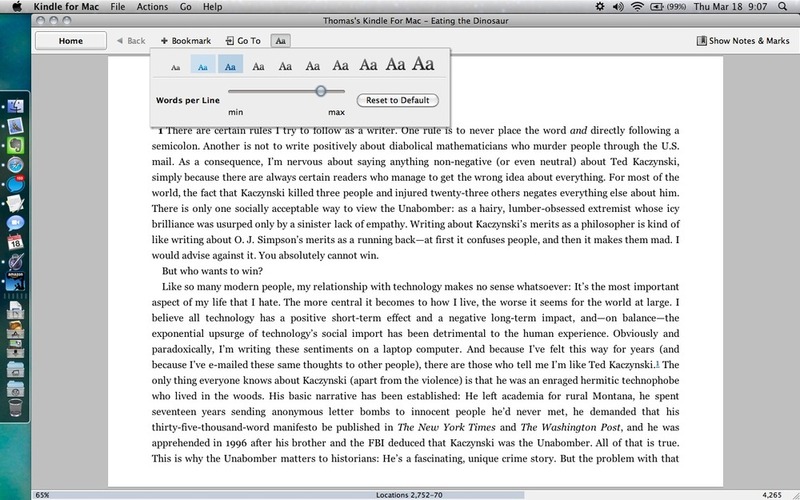 Bad: Kindle For The Mac | The Small Wave. Amazon very quietly released Kindle for the Mac (beta) yesterday. I think the reason they were so quiet about it is that it’s a pretty poor first effort. On the iPhone Kindle app, which has been available for a year, I can utilize fullscreen reading and modify the text color/background from one of three styles. Wouldn’t you think I could do at least that much on the Mac version? Well, you can’t. Seriously, they’ve had a year for this, and this is what we get? It looks like something Amazon slapped together over a weekend. I love reading Kindle on the iPhone. As for the Mac, I’m glad Amazon took the step, but disappointed in the effort. It’ll be hard to get immersed in a book when the trappings of a computer (menu bar, etc.) are all around you. This entry was posted in General and tagged Amazon, Apple, ebooks, Ereader, Kindle, Mac, Microsoft by Tom Reestman. Bookmark the permalink. qka,The whole thing is just badly thought out. To your point, I can adjust the width by adjusting the app’s window. But of course the more I narrow the window, the more of my desktop I see. It’s a trade off. I showed the app full screen to block out as much “distraction” as possible. Some of these things seem so basic to an ereader I’m surprised Amazon released it as is. Slapping the “beta” tag on it does not excuse such a weak first effort. Judging from your screen shot, the text is in too wide a column to read comfortably. It also appears that you cannot adjust that width.Ick!